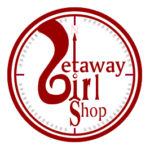 Welcome to the Getaway Girl Shop! The GetawayGirlShop and its sister site, www.GirlfriendGetawayPackages.com were created in early 2008 when I realized that working a “real” job and needing to drop everything to pick up my autistic daughter at school at a moment’s notice were no longer compatible. This decision also gave me time to explore a market that I had become interested in while working in the tourism industry in Western North Carolina – Girls Weekends and Girlfriend Getaways. Now, I’m home-based and I live vicariously through my site visitors. I enjoy knowing that all the gals hitting my sites are gearing up for bonding and memory-making trips. What fun awaits you all! Although I’ve sold quite a few designs through the shop, I’ve yet to see them in action. If you purchase from this site, please send photos of your group wearing my designs or send me a link to photos on your own site or blog. With your permission, I’d love to post them on my site too. Just use the contact us link at the bottom of the page. Thank you!